Elderberry syrup is a beloved home medicine used to prevent and treat colds and flus. Learn about the health benefits of elderberries and how to make your own homemade elderberry syrup recipe. Several years ago, I developed a tickle in my throat. Classic sign of a looming cold. My dear friend Meg from the Eco-Institute swooped in and introduced me to elderberry syrup. “The berries are from the farm. They’ll kick your cold,” she assured me. I admit I was a little skeptical. But this elderberry syrup recipe was just so delicious! I took it effortlessly daily until I realized my throat tickle was long gone and my cold never showed up. That’s when I began faithfully taking elderberry syrup for colds, whenever I felt the first signs of scratchy throat. Since my move to Switzerland, I hadn’t come across any elderberry syrup. A friend asked where she could find some here in Basel, but I hadn’t a clue. The next day, I was walking along my usual path when, like magic, I saw in the corner of my eye what looked like a wild elder tree filled with ripe berries. No way. I identified the plant, and sure enough, I had come across four Sambucus nigra trees. Nature has a way of whispering your way when the timing’s just right. With the help of my mother, I gathered the elderberries in the rain on a steep incline along the river. I had just enough to make my own homemade elderberry syrup recipe, which is just what I did with the help of my niece. Native Americans have long used elderberry as a remedy for coughs, flus, and viral infections. The berries are rich in flavonoids, in particular, which have antioxidant and immune-enhancing properties effective at treating flus, bacterial sinusitis, and bronchitis. These fruits also have antiviral and anti-inflammatory properties and are reportedly very helpful for upper respiratory infections. Elder flowers can also be used medicinally; they have traditionally been used to induce sweating to lower fevers. There have been many studies on the medicinal benefits of elderberries. Two studies tested the benefits of elderberries on animals, finding that the berries inhibited the flu virus and helped treat the flu and other viral infections. Various human studies have shown that elderberries help reduce cold duration and symptoms associated to colds and flus. Disclaimer: I am not a doctor and this is not medical advice. This homemade elderberry syrup recipe is not a replacement for pharmaceuticals or for a doctor visit. The FDA recognizes elderberries as generally being safe. However, the berries should never be eaten raw as they can cause digestive problems and diarrhea. Furthermore, the leaves, bark, root and peduncles should not be eaten as they contain high levels of cyanogenic glycosides, which can cause nausea and diarrhea. Elder (Sambucus nigra) can be found in most of Europe and North America. The fruits appear around September or earlier. It’s a small tree or large shrub with many branching stems and a smooth bark with lenticels. The leaves are opposite and pinnately compound with a row of 5-11 toothed leaflets. Use a plant guide to aid you in your identification. Prior to harvesting, always be 100% certain of your identification as lookalikes can be deadly. Do not confuse with dwarf elder (Sambucus ebulus), spikenard, or water hemlock, all of which are toxic. There are various techniques to making elderberry syrup. This particular recipe makes two small tincture bottles worth. Elderberry syrup shelf life varies depending on your recipe. This homemade elderberry syrup recipe will keep for 3 months in your fridge. Pick the berries off and put them in a large bowl. Put 2/3 cups of elderberries + 2 tbsp. or more water in a pot. Simmer until juicy. Line glass jar with rice nut milk bag. Place potato ricer on top. Transfer elderberries and juice into the potato ricer. The juices will drip through the nut milk bag into the jar. Press the potato ricer to extract all the juices. Transfer elderberry juice back to your pot and simmer for a few minutes to let it reduce a bit. Add as much honey as there is elderberry juice in volume. Mix and simmer several minutes. Take off heat and transfer liquid with your funnel to your bottles. This homemade elderberry syrup recipe is a simply delectable herbal medicine concoction. Take several tablespoons a day when you feel a cold coming on, or to shorten the duration of your cold. If you aren’t into DIY, consider purchasing some elderberry syrup from Nature’s Way, from Mountain Rose Herbs, or at your local health food store. Will you be trying this homemade elderberry syrup recipe or buying elderberry syrup yourself? Comment below! 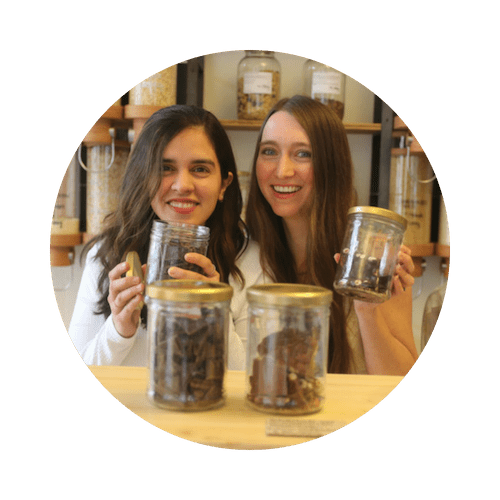 You might also enjoy learning how to make an herb press from salvaged materials or about our other immune-boosting herbal remedies, such as our homemade cough syrup, how to make rejuvelac, or our turmeric infusion. For more zero waste health tips, check out our free Intro to Zero Waste Living class. Observe and Interact – Take notice of how a particular herb positively affects your body. This homemade elderberry syrup recipe can support us in fighting colds and flus. Catch and Store Energy – The elderberries are ripe for some short weeks in August and September only. Catch their medicine by making a this homemade elderberry syrup recipe that will last for 3 months (or longer if you use alcohol!). Obtain a Yield – The finished product of making this homemade elderberry syrup recipe yields healthful benefits. You can also obtain a yield by trading your syrup with friends and family. Use and Value Diversity – There are countless plants available in which to derive medicines.